Megeve is one of world’s iconic ski destinations. Created by a Baroness of the famous Rothschild family a century ago as a French answer to St Moritz, it has always been synonymous with the best of everything. Unlike most well-known French ski areas, Megeve was not built from scratch in the post-war era but was founded upon an original village that dates back to the 13th century and, with its cobbled streets surrounded by enticing restaurants and boutiques, oozes Gallic ambience. A Mecca for foodies, it is also home to the only three-Michelin starred chef in the Alps. To add further to Megeve’s appeal, the surrounding slopes, located within the Mont Blanc massif – and extending to 445km thanks to connections to neighbouring ski areas – are some of the most scenically attractive in the skiing world. Megeve’s local ski slopes are divided into three main areas and in addition you can buy regional lift passes which include more skiing at neighbouring resorts if you wish. Added together the length of runs in this ‘Evasion Mont Blanc’ lift pass area total nearly 450km – one of the world’s biggest areas and plenty to keep you entertained for a week, or even a season. This vast amount of terrain means that there’s something for all standards of skier, but regular recreational skiers will particularly enjoy the huge amount of easy, cruising, blue and red pistes which in many cases are attractively located on tree-lined slopes and offer magnificent views as you descend. The closest ski slopes to the resort centre are on Rochebrune, linked by a gondola from the heart of the village or by a separate cable car from the outskirts. The second, larger ski area is on Mont D'Arbois which is connected to Rochebrune by a ‘horizontal’ cable car (but without a piste connection) or can be reached direct from the resort, although the base of the Princess gondola is 3km from the resort and reached by ski bus. You can ski down from Mont D'Arbois to neighbouring resorts St Gervais and St Nicolas de Veroce over the far side of the ski area. The third area, Le Jaillet, is located on the other side of town and was previously not connected to the other two areas, but from 2012-13 the resort has introduced a horse-drawn caleche (a kind of long sleigh for which Megeve is famous) to take skiers from the ice rink in the centre of town to Jaillet instead of having to take the bus. A criticism often made about Megeve in the era of high-altitude French ski centres is that the slopes (1,100-2,353m) are low by modern standards, however locals claim this often works in their favour, as runs are open here when high-altitude lifts in the neighbouring Chamonix Valley are closed. The highest skiing is at Cote 2000 (Rochebrune sector) and Mont Joly (Mont d’Arbois sector). Megeve is particularly popular with the Parisienne crowd, and the slopes are very quiet mid-week except in the main French holiday periods. It also does not fit the mass market tourism sector so you are unlikely to find big crowds of Brits either. Because Megeve is not known as an off-piste resort one can usually find some good off-piste several days after a snowfall. But even so, the obvious places will get skied out quite quickly and as with powder days anywhere in the world, it’s important to be first on the slopes when the snow falls in abundance, and the quickest way to reach the best spots is usually to get the first bus in the morning. The main areas for enjoying fresh powder are from the two highest points of the ski area at Mont Joly and Cote 2000. There are many bowls and runs through the trees opening out into fields and glades but you need to ski with someone who knows the area. Beneath Mont Joly the whole mountain below the ski lift is left unpisted and offers some of its steepest and challenging terrain around Megeve. It’s also possible to ski over the back from the top of the Mont Joly lift and off the map but this is avalanche territory so it is potentially a matter of (your) life-or-death that you seek help from a professional guide if you wish to attempt that. There are long term plans to link Mont Joly to Les Contamines which will open up a lot of off-piste. Cote 2000 has a large off-piste area with the best terrain off to the right of the ski lift but you have to cross the ladies downhill piste and this is often cordoned off for race training. Jaillet/Giettaz also has some great off-piste and once again a guide is the best idea to take you to it and also ensure you coordinate your descent with bus services which you will need to connect to at the bottom, as the best runs don’t connect back to the lifts. If you wish to make more of your location than the nearby slopes, mountain guides office (+33 (0)45 50 21 55 11; guides-megeve.com) will be happy to take you on guided half-day or full-day tours to nearby areas including Chamonix (where the Vallee Blanche is an option), the grand massif, the Aravis and Courmayeur. They even offer heli-skiing into Switzerland and as far as the Atlas Mountains in North Africa. A major difference between Megève’s ski area and that of most other well-known French ski areas is that much of the terrain is below the treeline, resulting in hundreds of kilometres of easy-to-moderate cruising on trails cut through the forest. 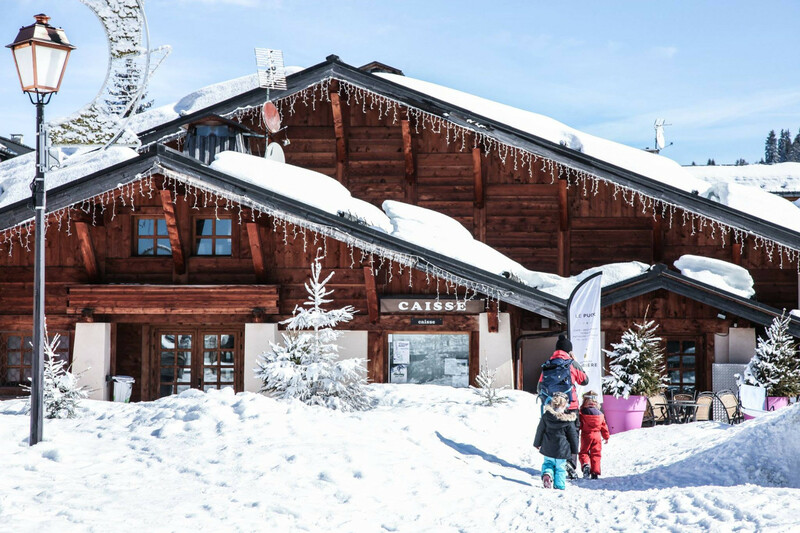 Of course, with the ski area being so large, there’s open terrain above treeline too, especially on Mont Joly and at Cote 2000, home to most of the resort’s steeper red and black pistes, but overall it’s very family-friendly fayre. Runs are up to 3.8km long and popular descents include the red down from L’Epaule to St Nicolas de Veroce which offers particularly splendid views of Mont Blanc and the fast Princesse gondola accesses some great terrain directly above the resort. Although the local skiing is within the three separate sectors, each area is large enough to provide at least a day’s entertainment, and the lift/sleigh links between them mean you can travel from one to another quite quickly if you wish to. If you purchase the Evasion Mont Blanc pass you can also take the ski bus to neighbouring ski areas including Les Contamines. Most of the beginner slopes are down by the village in the classic style so as long as snow cover is good they’re very convenient. A low-price beginner’s lift pass is available and there are free easy-to-ride magic carpet lifts for beginners’ use at Rochebriune, Princesse and Jaillet. Children aged 3-5 have several snow gardens operated by Club Piou-Piou, a division of the local French Ski School (+33 (0)4 50 21 00 97; megeve-ski.com) and located by the Chamois gondola (accessed from the village centre) and at the bottom of the Mont d’Arbois cable car. Each is equipped with fun runs and magic carpet lifts and the Club offers full or part day care (reservations essential). Megeve’s old school image and reputation for generally mellow terrain mean that it is not at the forefront of most people’s minds when asked to recommend a freestyle Mecca, so it may come as a surprise that the resort is home to three terrain parks at the last count, with several more separate terrain features at other locations too. The four are located in separate sectors and are not, perhaps, world class, but each has its charm and a good selection of hits. Most have snowmaking so terrain features can be created if Mother Nature doesn’t play ball. Closest to the village is the Waidzai Park on Rochebrun accessed by the Grand Champs chairlift. This is best suited to the less adventurous with small-to-medium jumps, whoops and a pyramid as well as a big air bag and a 500m snowcross course. The park is equipped with three automatic video cameras; you can download footage of yourself in the park at the end of the day by keying in your ski pass number and if you wish put it up on Facebook. A second park at the foot of the Mont Joux lift on Mont D'Arbois has some more challenging jumps with a good selection of rails to ride and another cross course. Other parks and features are on Jaillet where there’s snowcross track and at Giettaz (links to Jaillet) which has what some consider the best snowpark of the four with a wide range of jumps and rails as well as another snowcross course. Megeve was home to one of the great names in the history of downhill skiing, Emile Allais, who died six months after reaching his centenary, in autumn 2012. The influence of the great man has travelled around the world, but although he is now gone, you will find plenty of memories of him in the village, and these are worth seeking out. Allais was born in Megeve in 1912 the son of the village baker, just a few years before the transformation of the little village into a world-class ski area by Noémie de Rothschild, the wife of Baron Maurice de Rothschild, and 21 years before the first ski lift was installed. So Allais grew up during those crucial years of development and developed into a great skier, taking four gold medals and four silver medals in the early World Championships of 1935, ‘37 and ‘38 and a bronze in the 1936 Winter Olympics at Garmisch-Partenkirchen where he shook hands with Hitler, not knowing who he was at the time, but didn’t join in the Nazi salute. However Allais’ influence was just beginning, he founded the École du Ski Français (ESF), now the largest ski school in the world; he created the Rossignol Allais 60, the first metal-edged skis which gave French victory in the 1960 Winter Olympics in Squaw Valley. At various times he coached the Canadian and US teams and helped in the creation of ski resorts including Courchevel and the Chilean resort of Portillo. Famous names he taught to ski included Cary Grant and Brigitte Bardot. The list of achievements goes on. But back when he was first winning medals, Allais had also been a tailor, working in his uncle's shop, where he helped his uncle create special trousers for skiing, an idea that had not dawned on anyone else at that point. His ‘fuseau’ was the height of ski fashion for the next 50 years. You can still shop where Emile worked all those years ago in the central Place de l'Eglise (AAllard, 148 place de l'Eglise; +33 (0)4.50.21.03.85. aallard.com), now run by his children and grandchildren. You can of course also ski the Allais piste above the village and now you'll know where the name comes from when you see it on other pistes around the French Alps. Le Comptoir du Père Sotieu Rue du Général Muffat St Amour (+33 (0)4 50 21 67 51) is the place to start your day off with a drink of this cosy tea shop’s signature "Chocolat de Megeve” and fresh croissants. Aux délices de Megeve, 290 route du Palais des Sports (+33 (0)4 50 21 30 48) is a wonderful tea room serving food that’s both fresh and fashionable, with both healthy and indulgent options on the menu. Les Mandarines, Mont d’Arbois (+33 (0)4 50 21 31 27). Beautifully located chalet dating back to 1934, located 1800m up and mentioned in the Gault Millau gourmet guide. Mandarines has a lovely atmosphere and excellent mountain food, served by a cheering open fire. A lovely man takes your skis upon arrival and looks after them until it’s time to leave. Chalet Du Radaz, Rochebrune (+33 (0)4 50 58 94 44) is accessed directly from the Cote 2000 ski slopes and serves what’s popularly regarded as the best tartiflette on the mountain, as part of a range of Savoyard specialities. Les Enfants Terribles, Place de l'Eglise (+33 (0)4 50 21 20 02). Located next to Hotel Mont Blanc in the village centre. Its name is taken from the famous Jean Cocteau novel and film of the 1950s in a nod to the fact that, at that time, Cocteau remarked that Megeve was a suburb of Paris, such was its popularity then, as now, with residents of the French capital. Cocteau was a regular visitor to the Hotel Mont Blanc. Les Enfants Terribles specialises in taking French Savoyard cooking to new levels and is regarded by locals as very expensive, with main courses typically €28-48. Steak au poivre is the signature dish and it is worth visiting for the stylish 1950s retro décor, again themed on Cocteau films. Flocons De Sel, 1775 Route du Leutaz (+33 (0)4 50 21 49 99) has made waves not just in the ski world but across the global culinary scene with the achievements of chef Emmanuel Renaut, the only gastronomic genius in the Alps to be awarded 3 Michelin stars. Expect unique gourmet cuisine to a world-class standard, and indeed at a price reflecting that, so that the fact you need to take a taxi ride out of town to the Hotel Megeve is only a small part of your spend. Le Vieux Megeve. 58 pl. de la Résistance (+33 (0)4 50 21 16 44). Approaching its 50th birthday (established in 1965) a Megeve institution serving traditional Savoyard food, well presented and always busy – so best to book ahead. Main course dishes are typically €22-28. Flocons Villages, 75 rue Saint-François, (+33 (0)4 50 78 35 01). At the other end of the price scale from Flocons de Sel, Flocons Villages offers the same excellent food in a mountain bistro style and with touches from the great chef, Emmanuel Renaut, but very reasonably priced by comparison with a three course meal coming in around €24. Club de Jazz Les Cinq Rues, 19 passage des Cinq Rues, (+33 (0)4 50 91 90 69) is a Megeve institution that has won accolades including “the Ronnie Scott's of the Haute Savoy.” Located in the resort’s atmospheric back streets, it is one of Europe’s oldest surviving jazz clubs, dating back some 65 years and has seen superstars including Memphis Slim and Stéphane Grappelli take to the stage. You’ll be very lucky if such A-listers are in town of course, but there’s still live jazz and normally a great atmosphere every night. Casino Megève, 199 rue Charles Feige (+33 (0)4 50 93 01 83). Although Megeve is famed for its wealthy clientele, and the casino is indeed a magnet for high rollers, you can in fact enjoy an evening in the casino – which is open until 3am nightly – without spending a fortune if you can stick to the 1 cent slot machines, among the 68 to choose from and not be tempted up to the €5 version or indeed the roulette, blackjack or poker tables. Besides the gambling there’s a good restaurant (this is Megève after all! ), the Equipe by the Purple Lounge where there are dinner concerts or other free entertainment every evening. You can also dance the night away in the Palo Alto disco. Get Snow Reports, Powder Alerts & Powder Forecasts from Megeve straight to your inbox!